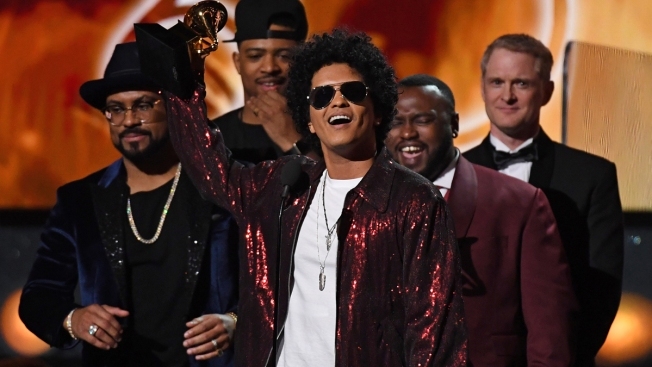 Bruno Mars receives his third Grammy for Album of the Year during the 60th Annual Grammy Awards show on Jan. 28, 2018, in New York. He took to Twitter this morning to remember Bruno Sammartino. The Grammy Awards are extending the number of nominees in its top categories from five to eight. The Recording Academy told its members in a letter released Tuesday that the nominee increase "will better reflect the large number of entries in these categories and allow voters greater flexibility when selecting this year's best recordings." Album of the year, song of the year, record of the year and best new artist are the categories that will be affected. The change comes months after the Grammys were criticized for the lack of women nominees at this year's awards show. For years, the organization has been called out for the lack of diversity when it comes to winners in the top four categories, where awards tend to go to acts in the pop, rock or country music genres, instead of hip-hop or R&B stars, even in years where Kanye West, Eminem and Mariah Carey were predicted to win. Another change at the organization is with Neil Portnow, the president and CEO of The Recording Academy, who will step down next year. Portnow, who has led the academy since 2002, was criticized at this year's Grammys when he said women need to "step up" when asked about the lack of female winners backstage. Only two female performers won awards during the live telecast. Bruno Mars won album, song and record of the year at this year's show, while Alessia Cara was named best new artist. Voting for the 2019 Grammys will take place in the fall and will include songs and albums released between Oct. 1, 2017 and Sept. 30, 2018.